On Tuesday March 29th at 3 p.m. Eastern Time, MIT CoLab (@MITCoLab) and Emerald Cities Collaborative (@EmeraldCities) will co-host a Twitter chat (#citychat) on the role of anchor institutions in climate mitigation and resilience. This conversation is the second in a series of four co-hosted Twitter chats broadly addressing equity, economy and climate resilience in low-income communities of color. 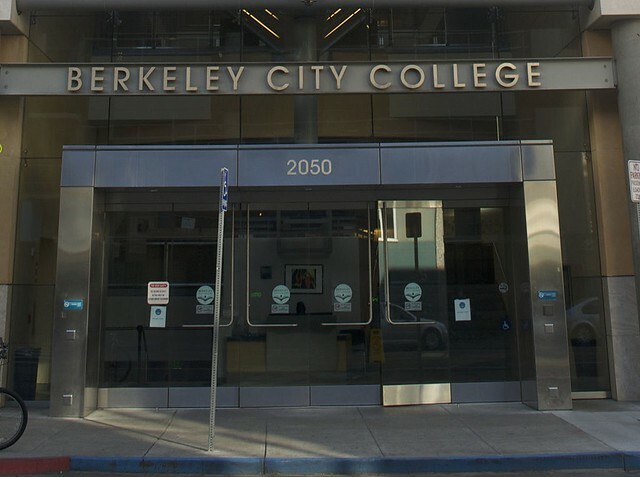 As major, place-based institutions, community colleges like Berkley City College are local anchors. Photo Credit: Wikimedia Commons/ Noah Salzman. Low-income communities and communities of color bear a disproportionate burden of the impacts of environmental hazards and climate change, and are subject to the disinvestment that results in a shortage of jobs and economic development. Frontline communities often include environmental “hot spots” – areas that are close to power plants, toxic waste and other sources of pollution – as well as older buildings contaminated by lead paint and mold. These environmental hazards result in residents experiencing higher levels of diseases such as cancer, asthma and other respiratory illnesses. Additionally, limited – or no – access to fresh, healthful food leads to diet-related maladies such as obesity and diabetes. Fortunately, recognition is growing that anchor institutions – major local, place-based nonprofit institutions including hospitals, universities and community colleges – can play an important role in strengthening the physical, social and economic resilience of their surrounding urban communities. Grounded in a particular place for the long term and with substantial purchasing and investing dollars, they can contribute to building a just and sustainable economy while bolstering climate resilience. They also articulate the relationship between health care institutions and climate resilience, noting that as “average temperatures rise, heat island effects in dense urban areas will exacerbate chronic respiratory conditions in the elderly and children”; and that a growing number of extreme weather events – hurricanes, tornadoes, floods, fires, drought – “will require a more resilient emergency care infrastructure capable of delivering potable water and health care. Furthermore, grid reliability is likely to continue to be an issue in unstable energy markets.” And “an active and resilient health care infrastructure can provide essential ‘safe haven’ services” during emergencies. Equity/community engagementthat ensures the inclusion of low-income communities of color in resilience planning and implementation. What mechanisms are being used to encourage anchor institutions to support community development and climate resilience? What are some examples of anchor institutions contributing to community development and climate resilience? What specific steps are those anchors taking? Are these strategies creating jobs and contributing to local economic development? How? Does the local anchor institution strategy have an equity inclusion component? What about a local hire agreement and/or an emphasis on minority contractors? Please join this important discussion with our panel of experts, including: Denise Fairchild and Tara Marchant of Emerald Cities Collaborative; Gary Cohen of HealthCare Without Harm; Allison Manuel and Claude Copeland Jr. of Northwest Bronx Community and Clergy Coalition; and Steve Dubb of The Democracy Collaborative. It’s easy to join the Twitter chat. Just follow #citychat on Twitter from 3 p.m. to 4 p.m. EST on Tuesday March 29th and share your thoughts. Even if you don’t have a Twitter account, you can watch the conversation unfold here. We should also ask anchor institutions if they have a sustainability plan. We could also ask them if they have participated in a community planning process in their local community to create a sustainability plan or would they be will to help fund one for the community? Good questions Bill. The #citychat panelists have all been working closely with anchors in various communities. They should be able to speak to these questions on Tuesday.